Last week I had the pleasure of attending a local food bloggers meetup at Paris 66 in East Liberty, organized by Luke, who used to work at Paris 66, and Mike (FoodBurgh), the meetup group organizer. It was so nice to finally meet in person some folks whose blogs I have been following (Nicole of Yum Yum; Roddy of Rodzilla Reviews; Em of Forked! ; and Lauren of Burghilicious) and some new folks whose blogs I am now following (Laurie of Tuesdays With Dorie and French Fridays With Dorie; Erin of Community Cucina; and Janelle of VegOut Pittsburgh). What a fun group of people! Lori and Fred, the owners, were sweet to stop by and chat with us, and gave us a little insight about the restaurant as well. The inside of the restaurant truly has the feel of a cafe in Paris. The tabletops are decorated with carefully laminated copies of ancient postcards of Paris that had belonged to Fred's great-grandmother. On to the food. I had never been to Paris 66 before, and I understand that they had recently changed their menu to move away from serving mostly crepes while expanding their menu options. Being a fan of crepes, however, I really couldn't resist trying their signature local, organic buckwheat crepes. I ordered the La Marseillaise, which I am ashamed to say I cannot pronounce despite being Canadian, but it is a "rolled galette stuffed with scallops, shrimp, shallots, saffron bechamel." 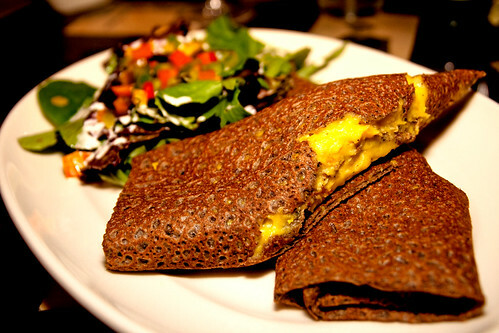 This was my first ever experience with buckwheat crepes, and I wasn't really sure about it at first, but it grew on me over the course of the meal. One warning, however, is that the buckwheat flavor is really strong, so someone who doesn't like buckwheat probably wouldn't like this. I personally didn't mind it too much. The La Marseillaise ended up being pretty good, but very, very filling. The buckwheat is really hearty and the saffron bechamel is thick and rich, so if you're looking for a "light" meal option, this isn't it. Despite being starved because we didn't have dinner until 9 pm, I could not finish my crepe. Throughout the meal I had also had tastings of other people's appetizers and desserts. Most of them were good, but the one thing that really stood out for me was a dessert crepe with banana and chocolate sauce. Oh my, when that got passed down to my side of the table, I had quite a few more bites of it than I had intended. I am already itching to go back just for the banana crepe. And when I do, I will be sure to snap a picture and write an updated post on it. 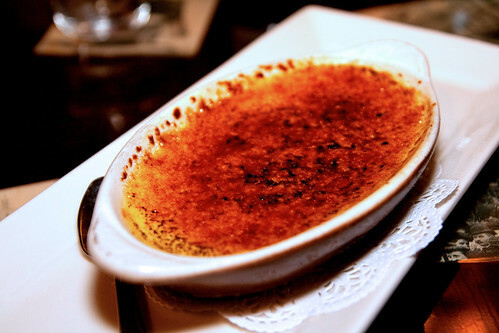 In the meantime, check out Yum Yum's post on this outing for her take on Paris 66. I'm sure some of the other bloggers will be posting their thoughts on Paris 66 as well, and I will update this page (below) with links to their blog posts when they are available. And if you are a food blogger in the Pittsburgh area, join us!